Review: Fleeing Fascists, But Caught In 'Transit' German director Christian Petzold adapts a 1944 Holocaust novel by setting it in the modern day. The result is a haunting and beguiling narrative of 21st-century displacement. 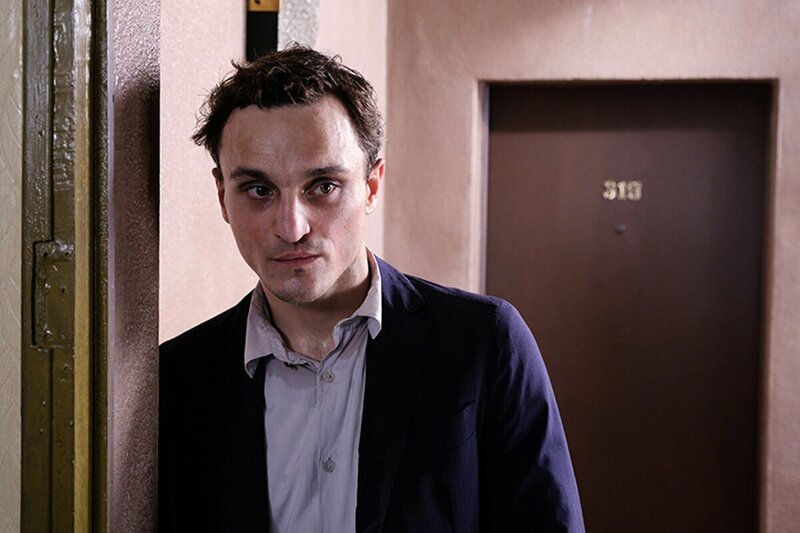 Franz Rogowski plays a man who flees to Marseilles and finds himself stuck there in the film Transit. In his last three features, the brilliant German director Christian Petzold has made mysterious, arresting and subtly heartbreaking dramas about characters fighting against the headwinds of history. In 2012's Barbara, his longtime muse Nina Hoss plays an East German doctor whose suspected subversion gets her exiled to the country practice, where she can be more closely managed. Hoss again starred in his 2014 hit Phoenix, a Hitchcockian story of dual identity about a concentration camp survivor who works her way back into the life of the husband who may have betrayed her to the Nazis. And now with Transit, Petzold follows a humble technician who flees the German occupation as it pushes through France, pinning him and others in the port city of Marseille. The conceptual twist with Transit is a doozy. Adapting a 1944 novel by Anna Seghurs, Petzold has taken a Holocaust narrative and moved it to the present day without altering the basic parameters of the story. There are no mentions of Nazis, but there's still a German fascist force that's taking over France, staging house-to-house searches and raids, and the consequences for those without the right paperwork are similarly bleak. Petzold risks minimizing the specific horrors of World War II, but Transit is a unique animal, like a hybrid between speculative science fiction and a drama of 21st-century displacement. He's made a film about refugees, premised on society's never-ending potential for fascism. True to form, he's also made an utter beguilement, tied closely to characters whose motives and feelings are not entirely obvious, even to them. Looking uncannily like a young Peter Lorre, Franz Rogowski stars as Georg, a German Jew who's first seen hiding out in Paris, which is overrun by occupation forces that will surely catch him in their net. Before he flees for Marseille, a confidant pays him to deliver two letters to a communist author named Weidel — one a document from the Mexican consulate, which is offering him papers and asylum, and one a note from his wife. But when Georg shows up at Weidel's hotel room, he discovers the author has slit his wrists, leaving behind a few effects, including his latest work-in-progress. Georg has no intention of assuming Weidel's identity when he gets to Marsaille, but when he arrives at the Mexican consulate to return the materials for a finders fee, he's assumed to be Weidel and promised passage on a ship leaving the city in a few weeks. The only major sticking point is the dead author's wife Marie (Paula Beer), who's been trying desperately to track her husband down, even though the status of their relationship had been left in doubt. In the meantime, Georg's advocacy for a mute North African immigrant and her asthmatic son puts him into contact with Marie's current lover (Godehard Giese), a doctor who's trying to leave Marsaille to set up a hospital in Uruguay. George's resemblance to Weidel is alluring to Marie and the two develop feelings for each other, checked by his overwhelming shame about the secret he's carrying. As with Phoenix, Petzold is doing another twist on Hitchcock's Vertigo and its multiple identities, and the beautiful score, from composer Stefan Will, evokes the dramatic strings of a Bernard Herrmann piece. The audacity of setting Transit in modern-day Marseille pays off in the juxtaposition between the blue waters and sunny skies of a port city, and the threat of encroaching darkness that bears down on it. It's presented as a means of escape, with large ships ready to carry refugees to safety, but nobody ever seems to go anywhere beyond the waiting rooms of the Mexican and U.S. consulates, where they're eager to share stories of their ongoing hardships. The coastline, in effect, feels more like the edge of a cliff. Yet the mood of Transit is not as despairing as that description makes it seem. There's a romantic quality to Georg and Marie's relationship, despite its false pretenses, like they're locked into a performance that they need each other to play. And there's warmth, too, in Georg's regard for the asthmatic kid and his mother, who are poised on the brink of disaster, and for the minor characters who are in the same predicament, trying to find some angle that will win them their freedom. They are all like ghosts in a seaside purgatory, undocumented and unmoored and unseen. No one will notice when they're gone.